The Tube MP Studio V3 is a single channel tube based microphone preamp that builds on the success of the original Tube MP but with added features. Primarily, the unit features V3 technology which provides optimized reference points - presets that allow the user to select between preamp settings designed for guitars (electric and acoustic), keyboards, bass guitars, drums, vocals, and more. Also included is OPL (Output Protection Limiter), which precisely and accurately controls and maintains the output peak signal. 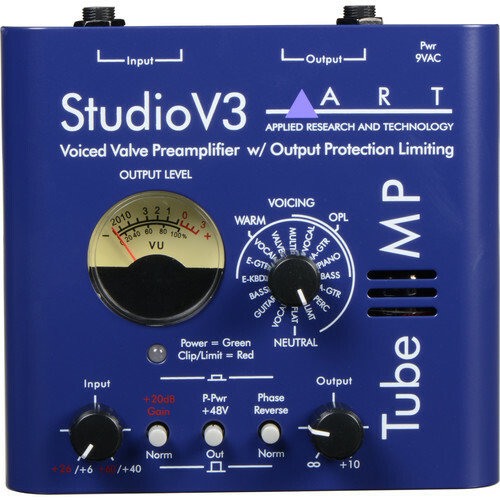 While its primary function is as a microphone preamp, the Tube MP Studio V3 is also a great direct box - impedance matching, amplifying and improving the sound of any instrument. Additionally the usage of external mic/line preamps has become increasingly popular over the past several years. The unit offers better performance and sound quality over that which can obtained from the onboard preamps included in many of today's low-cost mixers and multitrack recorders. The hybrid design of the Tube MP allows it to add warmth and fatness to a signal, while maintaining exceptionally low-noise. Quality sound combined with features like a 12AX7a tube, phantom power, and phase reverse, are what have made the Tube MP a staple in many studios. For a minimal investment, a Tube MP Studio V3 can provide the single largest improvement to the sound of a studio. Box Dimensions (LxWxH) 9.55 x 6.15 x 3.6"
Tube MP Studio V3 Microphone Preamp is rated 4.5 out of 5 by 11. Rated 5 out of 5 by repsov1 from Pleased with my results... for voiceover I do radio commercial voice over work from my home studio and was looking for a product to provide me more gain and also warm up my vocal... all without spending a lot of money in the process. For $ bucks I think I got MORE than I paid for and I think this is a great little unit! The only draw back I have found thus far is that there is a bit of noise if you need to crank up the input gain; however, I have plenty of gain, excellent headroom, and indeed I was able to add the warmth I sought... all of this is available without the need to crank up the input volume control. This is a great value and would definately recommend the unit... it performs well. Rated 4 out of 5 by Kevin Chang from Great Sound for the Price First of all, removing the Chinese 12AX7 tube for it is far from good. Simply use an inexpensive GE or Tesla tube instead can make it at least 3 times the value. With the price you can't find anything else better than that. Though the V3 features different characteristics, it does increase the noise floor. I would suggest to keep it at flat position to get the best sound, or turns to the Tube MP instead if you really don't need the V3. With the above modification and configuration it really sounds good. No doubt it can greatly outperform the onboard pres, and even compete those with many times of the price after replacing the tube inside. Rated 5 out of 5 by Brian from This preamp is the best kept secret in recording This little thing is incredible. It offers a huge variety of tone and a huge amount of gain for a tiny amount of dollars. The built-in limiter is super useful. With 1/4 and XLR options you can use it for recording with a microphone, recording an instrument, or as a live preamp for 1/4 instruments. The XLR jacks in the back aren't super sturdy and I wouldn't be surprised if they broke in a couple years. But I wouldn't feel disappointed if I had to replace this unit in a couple years; for the price it's worth it. Rated 5 out of 5 by Anonymous from Great value. I use this preamp for an auxiliary microphone system for video recording in a classroom. The build quality is great and it functions very well for the ridiculously low price. Rated 5 out of 5 by Seth Mc from It's great After a few hours of trying it out with a few different mic's an electric guitar plugged in directly, I found it to be a very useful preamp with lots of great characteristics. I haven't found it to add anything to the noise floor and with the right adjustments it can lower the noise. It works great with dynamic microphones, not sure if I would use it with a condenser. Rated 5 out of 5 by TV Prof from Versatle Product We use these at a college TV station for voice-overs. It has versatile set of options. You can connect either an XLR or a 1/4 cable and it has the same output connections--you can use it with a variety of equipment. It has both input and output level adjustments giving lots of options. It can add phantom power or not. The tube options give a nice variety of effects to the tone. We've found this well worth the investment, even buying several more since we like the first one so much! Rated 5 out of 5 by David from A project studio MUST Have I've used these for years and consider them a must-have for project studios. The V3 is the one, single thing you can do for you for your vocal mic that will yield the greatest impact. Awesome with condenser mics but also turns the ole Shure 58 into a viable vocal recording instrument. The V3 tube warms up the signal, but also you can mess with the input and output levels to get some very nice tube compression. Great for adding heft, presence and definition to vocal tracks. Although I've only used them for music I would think that no podcaster would want to be without one. Rated 1 out of 5 by Petross from Not a serious preamp Every time I attempt again to use this preamp recording documentary voiceovers with my EV-20 I end up wondering why I keep bringing it out of the case. It is unacceptably noisy with dynamic mics, even good ones like the EV-20. It is a such a good product idea and I love its features--if only the implementation were up to its concept. I ended up buying an old used Shure mixer to use instead. The resulting signal is much cleaner and more pure. Can it be used with dynamic and condenser mics alike? Yes, the phantom power button will give the condenser mic what it needs. Will this work with a turntable using the right adapters (dual RCA to 1/4 phono) for input and output? No. This is a Mono unit. For what you want to do I would use a Stereo (2 channel) box of some sort. Also, while this is a While this is a GREAT microphone pre-amp for the money, you will be better served with a stereo pre-amp designed for TT level signals. B&amp;H carries the Behringer PP400 which would be worth looking at. Good luck. I have an Mbox and two Yamaha monitors..I run my mic to the the pre amp..do I need a female or male xlr that turns into a trs cable/line ?? And how would I use it in my m box?? From your mic (female XLR ) to ART Pre amp (male XLR) from Pre amp (female XLR) to M Box (Male XLR)..there ya go.. I'm considering buying the ART Tube Studio V3 pre-amp, does it run only on batteries or can it run on AC? It comes with an AC adapter. It does not have a battery compartment.